Moto 360 - The only Smartwatch that Actually Looks Like One! Home » News » Moto 360 – The only Smartwatch that Actually Looks Like One! Moto 360 – The only Smartwatch that Actually Looks Like One! Undoubtedly, Motorola vanished all the doubts and dubiety about SmartWatches. If you are not a fan of the, common and tedious square and rectangular designs of the hefty Smartwatches of Samsung, Spice or LG, Moto 360 is made just to please your taste. However, the tricky part is the price and release date of this said Watch under Google banner is still not clear. 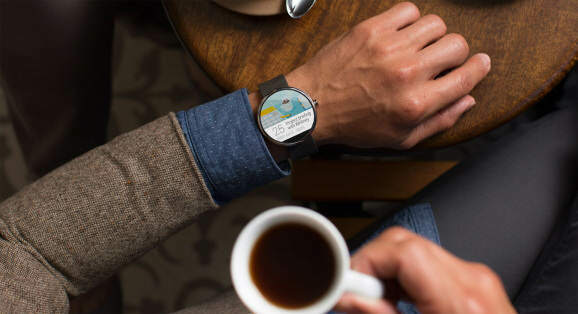 Release after release of Samsung’s SSNLF, Sony’s SNE and Pebble this summer, Moto 360 comes as a fresh air for techno-freaks of wearable technology. Breaking all clichés, with the face of regular watch this Smartwatch embellishes, none other than, Google’s operating system. In addition, the watch is adorned with customizable metal as well as leather straps. This will give the users a variety to choose from, and the Smartwatch can be worn in any and every style as one wish to wear it. Some other exceptional features are stated below. The Smartwatch have a black analog watch, just like the regular ones. The circular dial is set with the featuring a black analog screensaver, as per the user’s wish. Motorola 360 hones a similar display as that of Motorola X device. The screen covers the time and notifications of the device. Also, it is speculated that Moto 6 is adorned with Sapphire glass, which is 4 times harder and stronger than Gorilla Glass. The always-on look of the Smartwatch, thanks to the traditional wristwatches face, is quite favored by people. The decision to ditch the old geeky rectangular and square look, Moto 360 is good to go! Unlike smartphones, the battery life of Smartwatch is much important and noteworthy. As it is a wearable device, one cannot expect and accept its battery to drain out every other hour, because charging it is much cumbersome than charging a mobile device or a laptop. As per the speculation, unlike other Smart Watches, Moto 360 has a secret method of getting charged. As the company recently confirmed, the charging of its smart watches through magnetic induction, unlike the wiring mess of some other watches. The wireless charging is yet another feature to bring Moto-360 to top. There is another rumor lingering around Moto-360’s charging, which states that its peculiar purple backing can be there, to support the popular Qi charging method, as that of Google’s Nexus 4, 5 and 7. Expected to be launched at the price of $249.99, Moto-360 Smartwatch is here to stay and compete the upcoming i-Watch. Just wait and watch for the hit! The Moto 360 goes on sale today, and here’s the all-metal version coming in the fall.